For more projection than the normal rounded mallet head, we recommend the Mike Balter Mushroom Head mallet. The head design provides a smooth tone yet great attack when you need it. There are two models for Marimba : Yarn, and two for Vibes :Cord wound. They are either Medium Hard or Medium Soft. The Yarn covered are available in Birch or Rattan handles. For the Cord we recommend Rattan. 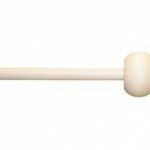 The Balter Basics Mallet Series is designed to provide the student and band program with an economically developed solution for obtaining mallets. With exceptional quality at an affordable price, this color-coded series has a model for every percussion situation. Balter Basics come with moderately thicker birch handles for more control and durability. These mallets are designed for Bell usage. The two types of heads are Aluminum and Brass. They project well and are used when a bright sound is required. The Brass are Hard mallets and the Aluminum, Medium Hard. Both have 5/8" heads. They are available with Birch or Rattan handles. The cornerstone of the Mike Balter keyboard mallet line is the Ensemble Series. These single-tone yarn wound mallets feature solid rubber cores that are the ideal weight for general playing. Their proven reliability has made them an industry standard that continues to exceed the needs of the player. Available in Birch or Rattan Handles. All handles over 15 3/4" in length other than the #17(15") and #18(14").Sold in pairs. Mike Balter has designed five basic models in the Pro Vibe Mallet Series. They range from Hard to Soft with a separate distinction for the Jazz model. They are all 15 1/2" in length other than the Jazz series which is 14 1/2". 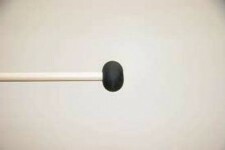 The heavier, rounded shaped Cord heads are ideal for the preferred vibraphone sound. Sold in pairs, we list the most popular handles: Rattan. These have the flexibilty and bend necessary for playing vibes. The Mike Balter Gong Mallet series consists of four various weights and sizes for gongs. The shafts are hard maple. The mallets are wound in Yarn and produce the desired impact for the size of gong being played. The four models (sizes) are: General, Heavy, Light and Wind(for Wind Gongs). They are top quality and designed for ease of control and effectiveness. 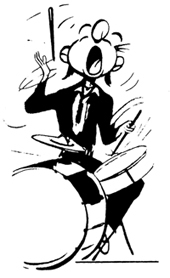 The Louie Bellson Drumset Series was designed for the drummer needing quick change overs. Some of the series includes double headed sticks which are ideal when doing a show with fast moving parts. These are innovative specialty sticks.